I like Lean Pockets. They're a convenient, quick and moderately healthy breakfast option. However, for years I've said the same thing whenever I'd see them in the freezer aisle, "What's the matter with the Lean Pockets people? Why don't they expand on these basic flavors and make a Mexican breakfast Lean Pocket? Try something with sausage gravy. These basic flavors are great, but where's the spark... the imagination?" 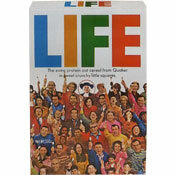 And off I'd go, dismayed, with my box of Sausage, Egg and Cheese Lean Pockets (my favorite Lean Pocket). So, wow... imagine my delight the first time I laid my eyes on this product. Would the Quesadilla Breakfast Lean Pocket live up to my dreams? Compared to traditional breakfast Lean Pockets, this Quesadilla variety offers a cheesy-salsa flavor explosion! Hooray! However, there's a few things that could be improved. The cheese and Mexican sauce carry this product... they create a terrific flavor that's present in every bite. The bits of green and red pepper add a certain freshness. The egg looks like scrambled eggs on the box, but in reality, you get small cubes of egg. Even this works. The egg adds texture and an egg-like consistency (appropriate) to the filling. Unfortunately, the turkey sausage tastes as much like turkey hamburg as it does turkey sausage. A few more spices in the meat wold have greatly improved the overall product. The crust or pastry portion of this Lean Pocket is a little tough after 2 minutes of microwaving. I had better luck microwaving for 1 minute and 50 second and letting Pocket set for at least 3 minutes. I have to wonder if this product would be slightly better with a whole wheat crust (and it'd be nice to get more than a single gram of dietary fiber). Overall, I liked this product. It's not head-and-shoulders better than Lean Pocket's simpler breakfast varieties, but it is quite tasty and and a nice change of pace. The exact name of the variety I tried was Southwest Style Sausage, Egg & Low Fat Cheese Quesadilla Breakfast Lean Pockets. Nutritional considerations: Each single pocket serving contains 250 calories, 2.5 grams of saturated fat, 0 grams trans fat, 50 mg cholesterol, 33 grams total cars, 1 gram dietary fiber, 5 grams sugar and 11 grams protein. 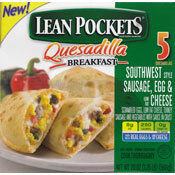 What do you think of Quesadilla Breakfast Lean Pockets? I found them to be really bad. Just not good. Cardboard taste and consistency for the outside, mush with a chili flavoring for the inside. Actually I think they are substantially better then Lean Pockets simpler breakfast varieties which I found to be pretty bland. Lean Pockets Quesadillas actually have some taste. I think they're ok. I don't like the outer crust, I don't think you can call that a tortilla or anything similar that they would dream of making a quesadilla with. However, the filling is pretty tasty and it fills me up. I still buy them. You've got to be kidding. I tried the southwest style Lean Pockets breakfast quesadilla this morning and was terribly disappointed. The package shows about three times the filling you actually get. And the only thing I could discern inside was the egg cubes. The rest was a brown, mushy mess. And the price. I paid $4.99 for a box of 5. Definitely not worth the price.